What terminology do Amazon Sellers need to know when importing inventory? Are you familiar with Incoterms, the Harmonized Tariff Schedule, or what a Customs Broker actually does? If not, this guide should help you as you are considering importing or plan to grow your import business. In the meantime, please be sure your books are in order. If you need help getting started, we will help you set up a QuickBooks Online Account for your Amazon business for FREE! This link includes access to a guide, a video tutorial, and a downloadable Chart of Accounts, specific to e-commerce sellers. While importing may be new to you, as an Amazon or eBay seller, it is not new to the world. Marco Polo (1254-1324) was one of the first and most famous Europeans to travel to Asia during the Middle Ages. He traveled farther than any of his predecessors during his 24-year journey along the Silk Road, reaching China and Mongolia, where he became a confidant of Kublai Khan. When importing inventory from another country, it is important to understand "Incoterms.” While some inventory sellers simply sit down, go on one of several popular websites, (Alibaba is a popular resource,) surf around, and then place an order, there are behind the scenes details that are important to be familiar with. Even if you are not placing large orders in shipping containers that weigh tons and take months to arrive, you still need to understand Incomterms. Incoterms are the Rules for international trade by any mode of transport defined by Incoterms® 2010. Incoterms clearly assign shipping responsibilities. Using Incoterms will help avoid misunderstandings resulting in lost money, lost inventory, disappointment, and strained relationships. These are some of the most important Incoterms to understand and will clarify who is responsible for the goods and services under contract at each stage of the importing process. Now that you have an introduction to the the key Incoterms you should be familiar with, you should consider hiring a customs broker. Customs brokers help sellers navigate the complicated customs clearance process. From the U.S. Customs and Border Protection Service: Customs brokers are private individuals, partnerships, associations or corporations licensed, regulated and empowered by U.S. Customs and Border Protection (CBP) to assist importers and exporters in meeting Federal requirements governing imports and exports. Brokers submit necessary information and appropriate payments to CBP on behalf of their clients and charge them a fee for this service. There are approximately 11,000 active licensed Customs brokers in the United States. If you are considering using a Customs broker, be sure they are actively licensed. What is the Harmonized Tariff Schedule and why does it matter to me? The Harmonized Tariff Schedule (HTS) is a 10-digit classification system specific to importing in the United States. As explained by the International Trade Commission: The HTS of the United States was enacted by Congress and made effective on January 1, 1989, replacing the former Tariff Schedules of the United States. The HTS comprises a hierarchical structure for describing all goods in trade for duty, quota, and statistical purposes. This structure is based upon the international Harmonized Commodity Description and Coding System (HS), administered by the World Customs Organization in Brussels ; the 4- and 6-digit HS product categories are subdivided into 8-digit unique U.S. rate lines and 10-digit non-legal statistical reporting categories. Classification of goods in this system must be done in accordance with the General and Additional U.S. Rules of Interpretation, starting at the 4-digit heading level to find the most specific provision and then moving to the subordinate categories. Essentially the HTS is the internationally accepted system used to classify traded products, and when you are importing to the United States, you must know the HTS code associated with the inventory you are importing. If you do not know which HTS code applies, please do not just “ask around on Facebook” in your favorite e-commerce selling group. It is really important to get the HTS code right. You can call the local field office of the US Customs and Border Protection Service and they will help you. Or, your customs broker can tell you. The HTS is important because it is used by all countries. Duties and tariffs are established based on the HTS code. Without a proper code, your inventory may be delayed at customs in both the exporting and importing country. Even worse, you may be assessed a fine or more expensive tariffs, adding to shipping costs which could result in unprofitable inventory. Now that you have familiarized yourself with important terminology and jargon related to importing inventory for your e-commerce business, you should feel more confident as you begin next steps. I recommend that you do your own due diligence and make sure you understand your responsibilities and the responsibilities of the exporter you are buying inventory from. This guide is for reference only. In addition to working with a licensed customs broker and other professionals as needed, I also recommend you ask for mentoring or advice from an experienced importer. People learn by doing, and are often happy to share what they have learned with others who are less experienced. And, as always, be SURE you have your books up to date. You can’t manage what you don’t measure, and it’s almost impossible to grow a successful inventory sales business if you do not know your numbers! 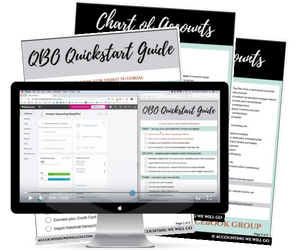 If you want to start with a firm foundation, enter your information below to download our FREE QBO Quickstart Guide to get you started using QuickBooks Online, including a video tutorial and Chart of Accounts specific to your Amazon business. Why Is Forecasting Difficult for Amazon Sellers?